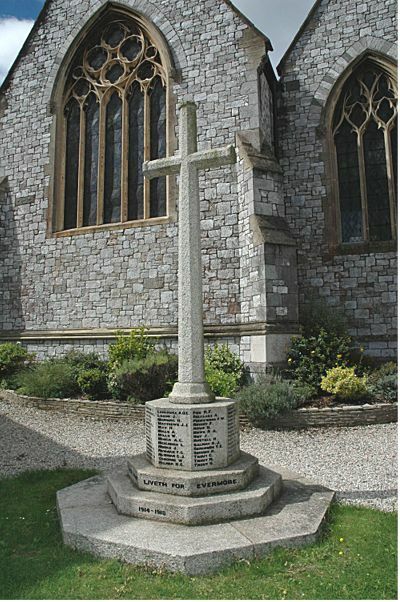 Topsham's War Memorial is situated on the edge of the churchyard just a few feet from the main street and is extremely visible to passers-by. Three octagonal slabs support the stone cross with the deeper top layer carrying the names of the fallen. Three faces show the names of of those who died between 1939 and 1945 while the remaining five carry the 1914 - 1918 names. The lowest slab carries the dates. Able Seaman George Henry Avery of the Royal Navy, HMS Gloucester. Son of John James Avery and Laura Emma Avery (née Pedrick) of Topsham, Devon. Born in Topsham in the June Quarter of 1922. Died 22 May 1941 aged 19. Stoker 1st Class Harold Francis Baker of the Royal Navy, HMS Hecla. Son of Henry and Ellen Baker (née Clapp) of Topsham. Born in Topsham in the December Quarter of 1921. Died 15 May 1942 aged 20. Flying Officer William Henry Boundy of 620 Squadron, the RAF Volunteer Reserve. Son of George and Eva Boundy (née Osborne); husband of Phyllis Mary Boundy of Topsham. Born in 1914. Died 23 June 1943 aged 29. Lieutenant Robin Lascelles Boyle of the 1st Battalion, the Welsh Fusiliers. Son of Vice Admiral, the Hon, Robert Francis Boyle, MVO and his wife the Hon. Cerise Boyle (née Champion de Crespigny ) Born in Fareham in the December Quarter of 1915. Died 24 May 1940 aged 24. Ordinary Seaman Eric Bowker of the Royal Navy, HMS Jupiter. Son of Arthur and Charity Mary Bowker (née Kingdon). Born in 1924. Died 27 February 1942 aged 18. Private David John Chambers of the Devonshire Regiment. Son of James and Florence Chambers (née Pym); husband of Lilian Maud Chambers of Topsham and brother of Herbert (see below). Born in Topsham in the September Quarter of 1913. Died 21 July 1940 aged 27. Private Herbert C. J. Chambers of the 7th Battalion, the Oxford and Bucks Light Infantry. Son of James and Florence Chambers (née Pym); brother of David (see above). Born in Topsham in the September Quarter of 1915. Died 4 December 1943 aged 28. 1667463 Leading Aircraftman John Davidson of the RAF VR. Son of John and Margaret Ann Davidson of Topsham; husband of Audrey (née Milton). Born in Tetbury in the December Quarter of 1920 Died 18 November 1945 aged 25. Worked at White's of Crediton as a carpenter and joiner. Also commemorated on the Crediton War memorial. Lieutenant Owen Marshall Gould of 19 Field Regiment, the Royal Artillery. Son of Leslie Albert and Edith May Gould (née Pidsley). Born in Topsham in the June Quarter of 1921. Died 20 February 1944 aged 22. Petty Officer Steward Edward Graham, Royal Navy, HMS Dulverton. Son of Samuel and Bessie Graham of Topsham. Born in 1917. Died 13 November 1943 aged 26. 1202993 Leading Aircraftman Cyril Hoare of the RAF, 242 Squadron. Son of Samuel and Ellen Hoare; husband of Constance Hoare of Dawlish. Born in Tivedrton in the September Quarter of 1910. Died 10 July 1943 aged 32. Believed to be the brother of Cyril (above) 1645985 Gunner Donal Hoare who died 2 October 1943 aged 30. Chief Petty Officer Cook Leslie Clarence Irwin of the Royal Navy, HMS Neptune. Son of William Henry and Emily Irwin of Topsham. Born in Topsham in the June Quarter of 1904. Died 19 December 1941 aged 37. Petty Officer William Ernest Lansdown of the Royal Navy, HMS Palomares. Son of Douglas and Annie Lansdown; husband of Gladys Emma Lansdown of Exeter. Born in 1918. Died 9 November 1942 aged 24. Lieutenant Arthur Herbert Manning of the 5th Battalion, the Essex Regiment. Son of Herbert and Frances Ella Manning (née Harrison) of Topsham. Born in Topsham in the March Quarter of 1911. Died 2 November 1943 aged 32. Carpenter Richard Henry Norton of the Merchant Navy, SS Avila Star (London). Son of John James and Annie Elizabeth Norton (née Gliddon). Born in Topsham in the March Quarter of 1918. Died 5 July 1942 aged 24. Able Seaman William Henry Lorraine Pope of the Royal Navy, HMS Challenger. Son of William John and Annie Pope (née Moore) of Topsham. Born in Crediton in the December Quarter of 1918. Died 11 January 1941 aged 22. Buried in Topsham Cemetery. Acting Sub-Lieutenant Robin Alec Stephen Pratt of the Royal Navy, HMS Dunedin. Son of Sidney Nicholas and Annie Pratt (née Bolt). Born in Topsham in the December Quarter of 1921. Died 24 November 1941 aged 20. Private Herbert Henry Smith of the 14th Battalion, the Sherwood Foresters. Son of William George and Kate Louisa P. Smith (née Towell); husband of Constance Joyce Smith of Topsham. Born in Topsham in the December Quarter of 1911. Died 20 March 1944 aged 32. Corporal John Hendry Thomas of the 1/5th Battalion, the Welsh Regiment. Son of Thomas George and Edith Alice Thomas (née Jones). Born in Plymouth in the December Quarter of 1923. Died 24 October 1944 aged 22. Chief Engine Room Artificer Wallace Henry Trout of the Royal Navy, HMS Bonaventure. Son of Rupert Henry and Bessie Emma Trout (née West). Born in Topsham in the December Quarter of 1908. Died 31 March 1941 aged 33. Boatswain's Mate Ernest Leonard Vine of the Merchant Navy, SS Avila Star (London) (see entry for Richard Norton above). Parents not yet identified. Born in the December Quarter of 1914. Died 5 July1942 aged 27. Able Seaman Ivor Frederick D. Whitty of the Royal Navy, HMS Avonvale. Son of Frederick and Lilian Whitty (née Pate). Born in Topsham in the March Quarter of 1923. Died 26 March 1942 aged 19.